I know its been a while since I’ve properly written on here (other than yesterday morning’s post), but things have really been very busy. The first big thing to share which I’ve already hinted at is that I have now gotten engaged to my beautiful other half Sarah! 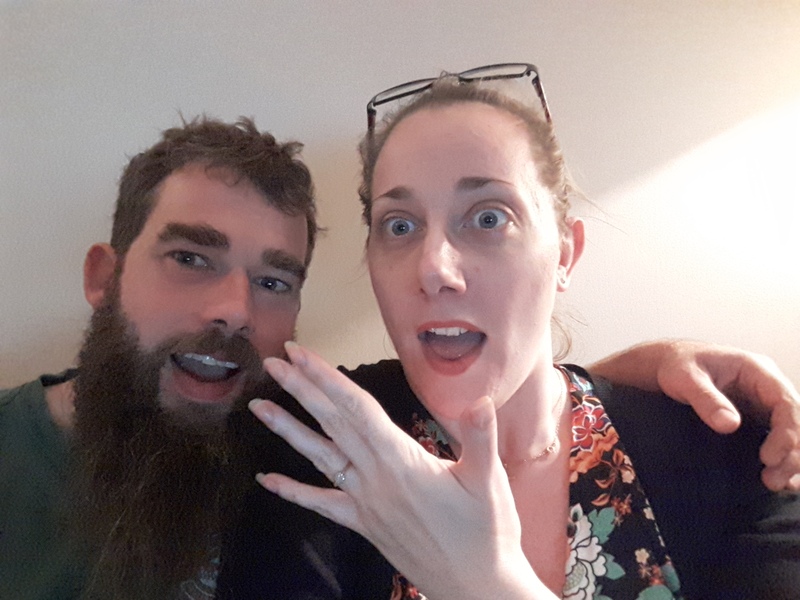 In July we celebrated our first anniversary in London which was an epic weekend; a few weeks later when the timing felt right I asked her “the” big question; the rest they say is history. We have been happily living together for a while now and are starting to plan our big day. The perfect time in question was a Monday when we both had the day off. Blessed with good weather we went on a lovely walk along a scenic path here in Essex. Pausing to soak up the lovely views I waited and hung back until we had some privacy as some other walkers passed us. Then with butterflies racing in my stomach I asked her. Thankfully she said yes! After strolling back to the van we headed into town to look at an engagement ring. I wanted to take Sarah to buy the ring after asking her so she could see the one she really wanted, to make the whole event that little bit more perfect. Then came the exciting task of telling family and close friends first before announcing things on good old Facebook. Moving to more health-based topics things are in general going rather well. I’m writing this the day after my first Humira injections which I’m happy to report went without any problems at all. The meeting with the nurse in the morning was thorough and very reassuring. We went through the paperwork, I was shown with a dummy pen how to use it, and practiced on myself a couple of times to get the hang of it. Sarah was with me all of the time and asked a few questions that I had forgotten about. Once all of this admin and practice was out of the way it was time to use the real thing. The actual injections didn’t hurt; I obviously felt something but it didn’t hurt and there was only a tiny dot of blood. Yesterday morning’s dose consisted of 4 pens; in two weeks time I have 2 then every 2 weeks after that I need one pen. From now on I feel comfortable with doing my injections myself. I was offered another visit for my next injections but to be honest I feel really confidence and relaxed with doing it myself next time so I declined. My exercises are going well! I have been working more on my weight lifting and have been making gains here. I have been noticing the knock on effect in every day life too – I find that I am able to lift more especially at work. I work my exercises around other aspects of life and of course my energy levels which do sometimes drop. Hopefully this will be something that will be reduced once the Humira properly kicks in. A last point to talk about briefly is my little band – Stick of Rock – is getting there. We have been rehearsing a lot recently and have our first gig in a long time coming up in a few weeks which I am so excited about. I do love playing live and it has been too long! Well there’s most of the big things that have been going on. There is other stuff I’m sure that I can’t think of at the moment but that’ll go into future articles. Have a great weekend people! This entry was posted in Crohn's Diary, Exercise, Lifestyle. Bookmark the permalink.